2012 A new year to start Blogging. Normally I Face Book, And Face Book, and Face Book some more. But I'm getting out of my comfort zone and branching out. Let's start with an introduction. My name is Jennifer Page. And I am a Kingdom Artist. I love to paint, draw, photography, and graphics. Not to mention seeing people get touched by God through the Arts. The Arts have always being a language of expression for me. When I am silent I can speak loud and clear with Love of course through the arts. Art is a universal language. And using it for the Kingdom of God can make a great Impact in the lives of people. Just take the simple Image of the cross. Yes the cross. It became a symbol for all humanity, a lasting symbol that has touched the lives of many. A symbol that has been controversial as well like that of recent years where some groups of people got offended at the site of the Cross. The Cross didn’t say a word, but the visual site brought about a feeling to cause an offense to someone or embrace repentance to another. Jesus did die on the cross over 2000 years ago. But the truth remains. The testimony of His life and Death has been printed on the cross. A symbolic art piece if you will. Jesus is alive now. He is no longer hanging on the cross. But he is sitting at the right hand of GOD the father, the creator of heaven, earth and everything in the universe both spiritual and physical. He will SOON return. Return for those who are prepared for his coming. As I wait for his return. Through one of my best languages, The Arts- I call others to be prepared with me. I call others to be reconciled to GOD who loves them. To be spared from Hell, a place where GOD is NOT, but only sorrow and pain. I shout out how much He GOD LOVES you and me. That YOU and I have a place to call home. A place with Jesus Christ. To have adventures with GOD now and much more in Heaven. Jesus Not only came to die in place of what we had deserved because we have ALL sinned. He came so that we might have life, to live in the fullness of His abundance. What does that look like? For my testimony which is still an unfinished book, still being written. In what pages of my life that I have made so far, abundance in the Fullness of what the Bible promises has been to me: Knowing who I am. Having a secure place of knowing where I am going. An adventure of stepping into NEW exciting places and activities that GOD directs me in. It’s having a relationship with Jesus Christ. And that’s only the beginning. My posts will be my visual love language. Jesus and His Love for you! ~Giving you resources, scriptures, insights, and my transparent walk, plus testimonies to encourage you along your journey. With that Said. 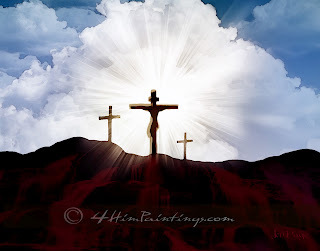 This Blog’s First Image post is “At Calvary”, the image of the Cross. Fly! Soar with the King! He’s Got your back!